Habit: Stem, leaf margin, pedicel hairy or not, nonglandular. Stem: 30--80 cm. Leaf: 3--15 cm; abaxially minute-scabrous, especially on veins, margin hairs many, short, sharp, ascending. Inflorescence: flowers 1--3. Flower: +- funnel-shaped, tube +- cylindric; perianth parts 8--18 mm, +- spreading at middle; filaments spreading, anthers generally exserted, glabrous or minute-sharp-bristly, +- wavy when open; ovary weakly 3-sided, style glabrous or +- hairy. Fruit: 7--12 mm, +- spheric, red; seeds generally > 3. 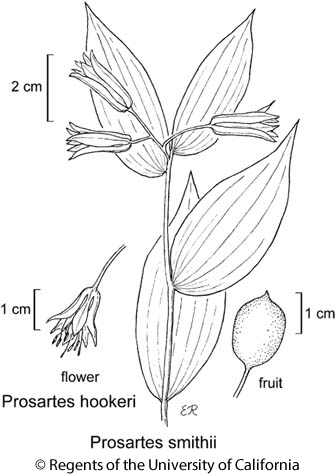 Citation for this treatment: Michael R. Mesler & Robin Bencie 2012, Prosartes hookeri, in Jepson Flora Project (eds.) Jepson eFlora, http://ucjeps.berkeley.edu/eflora/eflora_display.php?tid=39938, accessed on April 23, 2019. NW, CaRH, SN, CW; Markers link to CCH specimen records. Yellow markers indicate records that may provide evidence for eFlora range revision or may have georeferencing or identification issues. Purple markers indicate specimens collected from a garden, greenhouse, or other non-wild location.